The twin-lens reflex Wardflex II is the next oldest in my new collection and the second with some personal history. Most of the cameras I recently acquired have quite a bit of information available online. This one is an exception. About all I've been able to find out about it is the Wardflex was a rebadged import sold by Montgomery Wards. The original plastic version was sold before World War II and used 620 film. Post war through the early 50's they introduced another model by the same name with upgraded optics and a metal body that used 120 film. 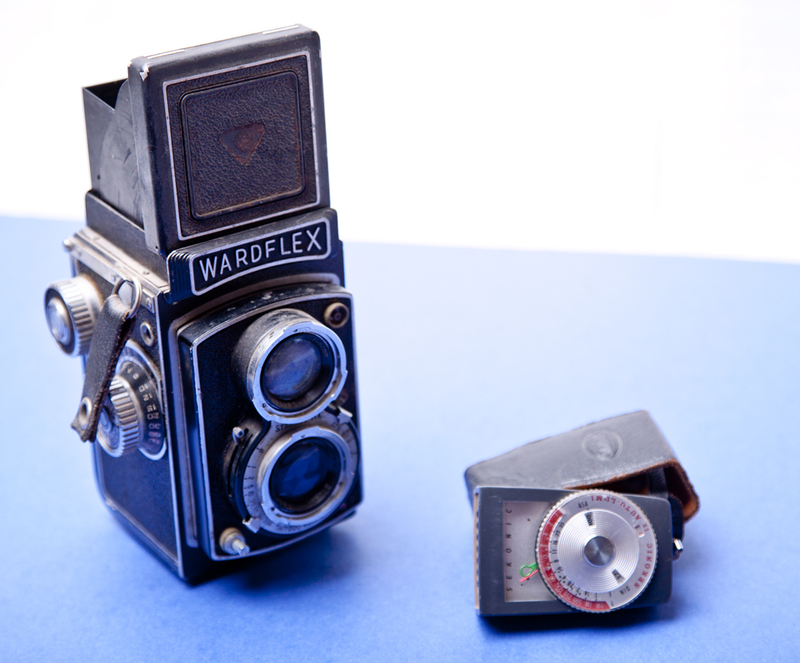 In 1957 they updated to the Wardflex II and sold it for several years. The lens opens up to f/3.5 and closes down to f/22 with a focal length of 80mm. Looks like the shutter speed is limited from 1 second down to 1/300th second and bulb mode. Like the Graflex, there's a bit of personal history with this one too. It also belonged to my great-Grandfather and given to my Dad by my Grandparents. He used it all through my growing up years until he got a Minolta SLR when I was in Jr. High or High school. Other than the shutter being a bit gummy it's in great shape. I need to get it in to get cleaned up and it should be good to go make some images. Also shown is a Sekonic Auto-Lumi model 86. There's more online information available on this than the camera. It was made between 1963 and 1978 and sold new for about $9.00. It uses a selenium photo cell as a sensor with the output displayed on a micro-amp meter. The amount of current generated by the light hitting the photo cell is directly shown on the meter. A simple, battery-less system with very few things to go wrong. It shows the average reflected light but can't be used for incident light.